Why King Joffrey, whatevah is the matter? Was it something you drank, perchance? If you are fan of the books or the show, a portion of that admiration for me, is due to the excesses of it. The pageantry, the subterfuge, the devious twists and turns of human nature, it’s addicting. But for me, the fact that every character seems to participate in the profuse quaffing of wine is awesome. Flagons and flagons of wine. From hedonist but just Lord Tyrion to his evil sister Cerce, there is a lot of juice flowing. Don’t they ever drink water? The whole point of this is that in the final wedding scene, young, cruel King Joffrey is glugging down wine that he professes he likes very much, maybe even more then his new bride. Suddenly he starts to hiccough and choke. Needless to say, the poison’s in the chalice and dies an agonizing, blue-faced death. Fare thee well, horrible boy-king. Had he paid any attention to the signs of impending doom, he could have avoided his gurgling demise. See, I know the wine they served at the reception. Yup, I’ve got a bottle right here. The label would have warned him of the potential danger within. Me thinks there is something suspicious about this wine, sire.. However, this Oregon winemaker is far from the evil doer in this episode. Owen Roe is a co-owned winery between the Wolfe’s and the O’Reillys. 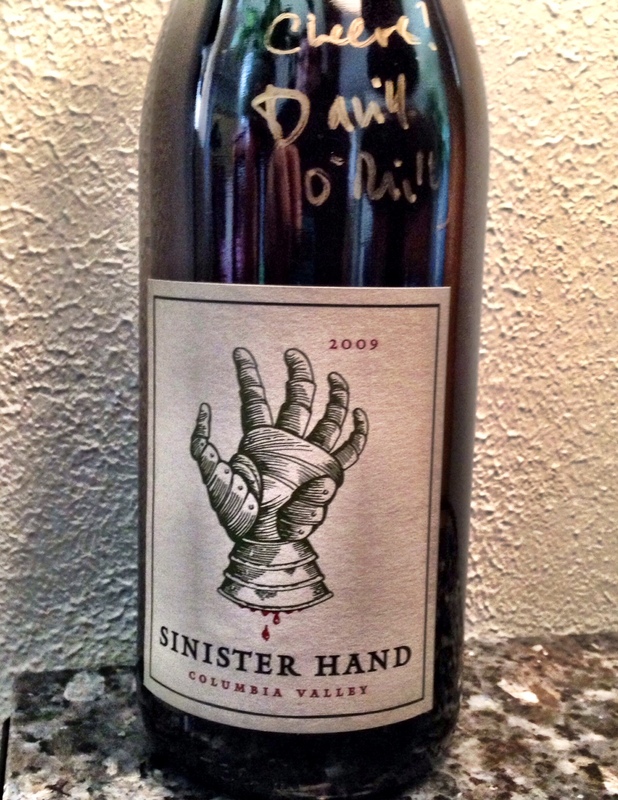 Sinister Hand is one of their signature red rhone blends, primarily grenache ,syrah and some mouvedre. I tasted this probably sometime in 2012, had David O’Reilly sign it and put it away and forgot about it. I know I liked it very much then, but since then I know that I need to crack this open immediately as some reviews I’ve read lead me to believe it’s probably losing it’s acidity but still a great drinker. I’m sure it’s very yummy in spite of it’s dripping label. You should read the full story about how this wine got it’s name. It is so very Game of Thrones, but in an old Irish lore sort of way. Adventures of a wine appreciator and her tasting notes via sometimes the semi-fictional persona, Cabfranca. The wines are true, the stories are mostly true, through a well lived sense of wine travel and the beauty that can be found along that trail. Link | This entry was posted in Uncategorized and tagged King Joffrey poisoned, Wine of Game of Thrones. Bookmark the permalink. 2015 is here and I have made some Wine Blogger Resolves.